I get giddy inside when the coffee shops start using the holiday themed cups. Not kidding, I will gasp in delight at the site of a snowman printed onto the side of my paper cup. I tend to buy no less than 3 different flavors of coffee creamer during any given shopping trip beginning in October all the way through January. I am on my second variety box of holiday K-Cups (48 count) and I am the only one who drinks coffee in my house. Oh, I bought the first one around Thanksgiving. It should have lasted longer. I look forward to the 10 hour Christmas road trip because it means stopping at countless rest stops where I will buy countless holiday beverages. 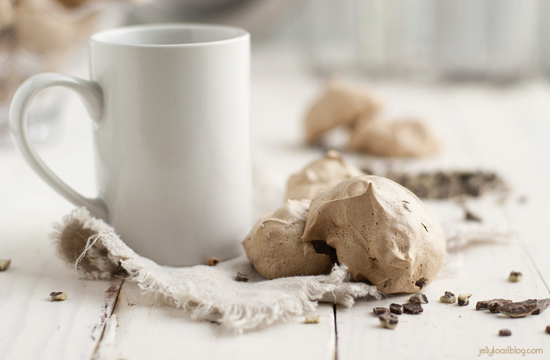 Of all of the holiday flavors that pop up in the coffee world this time of year (gingerbread, eggnog, pumpkin) a mint mocha combination is always my favorite. I have already revealed my love of chocolate and peppermint during this last month (both here and here) and I am starting to become concerned for myself. Can a person have too much mint + chocolate in there life? 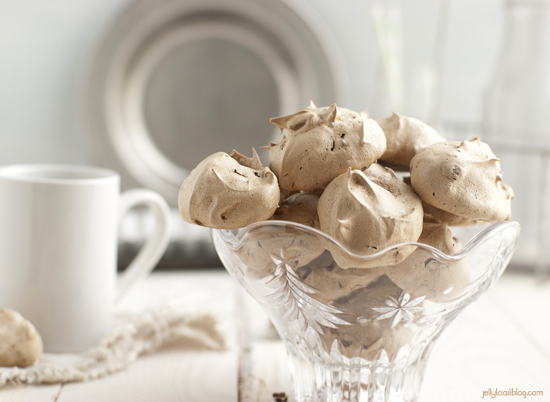 I truly hope not, because I just ate about a half dozen of these Mint Mocha Meringues. Now, in my defense, these clouds of minty heaven feature Andies creme de menthe baking chips instead of peppermint. So really, it’s completely different. 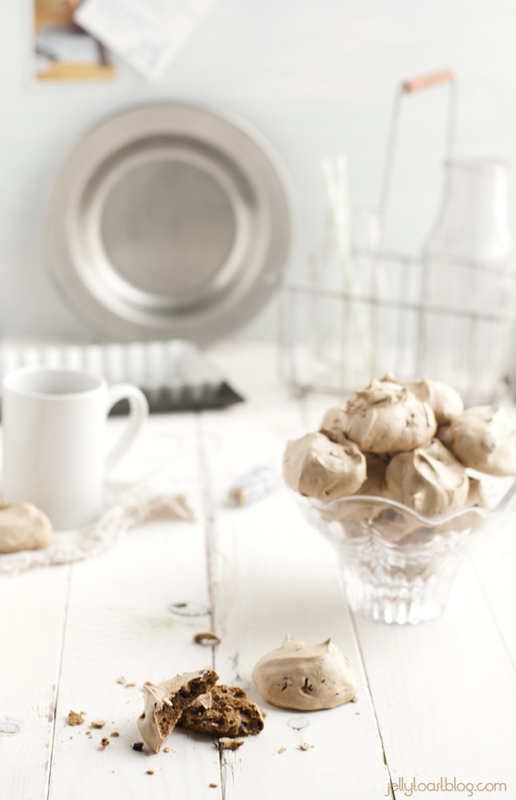 These little mint mocha meringues pack a serious punch of mint mocha goodness and as a side note also make your kitchen smell fantastic while they’re baking. 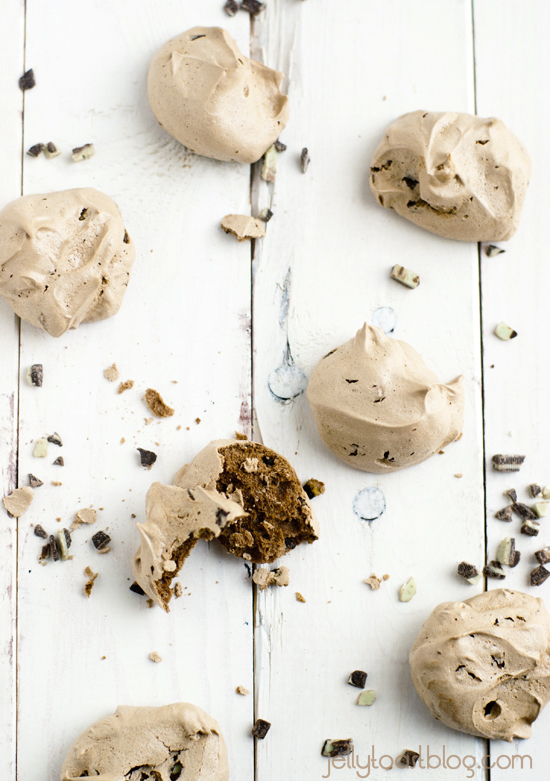 The coffee notes, dark chocolate and smooth, creamy mint mix together into the perfect little bite. If you’re a person who doesn’t groove on overly ‘coffee flavored’ things (which I don’t totally understand, but I happen to live with one such person) you can totally dial back the espresso powder to 1 teaspoon or even 1/2 teaspoon. But, if you’re like me and love a strong cup of coffee whenever the mood strikes, go with the 1 1/2 teaspoons. Now that you know my weakness for holiday flavored coffee goods, what is your favorite flavor of the season? Preheat oven to 300 degrees. Position oven racks to the top and bottom thirds of the oven. Line two baking sheets with parchment paper and set aside. In a medium bowl, whisk together sugar and corn starch. Set aside. In the bowl of an electric mixer fit with the whisk attachment, add egg whites and salt. Mix on medium speed until frothy, about 2-3 minutes. Add sugar in small amounts at a time, mixing a bit in between each addition. After all sugar is added, increase speed to high, and mix until egg whites are thick and glossy and stiff peaks have formed; about 8 minutes. You will need to stop and scrape the bowl down half way through mixing time. Add espresso powder and cocoa powder to the mixer and mix until well incorporated. Use a rubber spatula to gently fold in baking chips. Drop egg mixture by the spoonful onto the prepared baking sheets. About 15 per sheet. Bake for about 45 minutes or until cookies are crisp. Allow the cookies to cool completely on the rack. The cookies will stay crisp for about a day, and after that will become a bit chewy, but in my opinion, no less delicious. omg i am a total peppermint mocha FREAK! i am totally going to make these. I’m so glad I’m not the only one! Happy Holidays!